Steeltown is the second studio album by Legendary Scottish band Big Country. The album was recorded at ABBA's Polar Studios in Stockholm with Steve Lillywhite producing. It was released on 19 October 1984, in the UK and 29 October 1984, in the United States. Steeltown is the band's only UK number 1 album, topping the chart in October 1984. 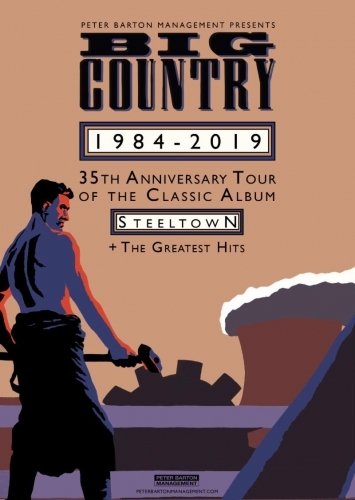 The title track Steeltown was written about the town of Corby, telling how many Scots went to work at the Stewarts & Lloyds steelworks when it opened in 1935, at the height of the Great Depression, but later found themselves unemployed when the steelworks declined in the early 1980s. "Clanging and crackling with energy, this second album from Big Country rings natural evolutionary changes on the band's stirring twin-guitar sound even as it frames still better news: bandleader Stuart Adamson has rapidly matured into a songwriter capable of bringing meticulous craft to his obvious passion! Many fans today consider Steeltown to be the band's finest work. Steeped in a stunning catalogue of proud and stirring hit songs such as 'Fields of Fire', 'Chance', 'In A Big Country' (which sold 2 million), 'East Of Eden' and their biggest UK hit 'Look Away', along with massive albums such 'The Seer', 'Steeltown', 'Peace In Our Time' and the triple Grammy -nominated, 'The Crossing', BIG COUNTRY continue to look beyond the next horizon in 2019. 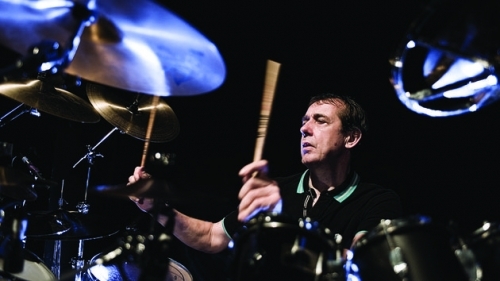 Both native of the band's hometown Dunfermline in Scotland. Initially driven by a shared vision of widescreen guitar melody, harmony and lyric, the classic Big Country sound was further enhanced later that summer by the arrival of drummer Mark Brzezicki and bassist Tony Butler. The band broke massively worldwide with the release of the album's classic singles 'Fields Of Fire', 'Chance' and signature song 'In A Big Country', which went on to become massive worldwide hits, selling over 2 million copies and driving 'The Crossing' to 3 prestigious Grammy nominations in the USA. The run of success continued throughout the 1980's with the release of the anthemic single 'Wonderland' and the second album 'Steeltown' (1984), which debuted at Number 1 in the UK and contained the hit singles 'East Of Eden, 'Just a Shadow' and 'Where The Rose Is Sown' . In 1985, Big Country appeared at Live Aid in London followed by further successful album releases 'The Seer' (1986, which included the bands biggest UK hit 'Look Away', which also reached Number 1 in the Irish Singles chart) and 'Peace In Our Time' (1988), which saw the band playing the first ever privately promoted gig in Russia at the Moscow Sports Stadium. At the start of the 90's 'Through A Big Country', featuring all the bands classic hits was released, followed by the fifth studio album 'No Place Like Home' (1991) taking the band's total record sales to well over five million copies. Further studio albums Buffalo Skinners (1993) and 'Why The Long Face (1995) followed, which saw Big Country landing the special guest slot on the Rolling Stones 'Voodoo Lounge' European tour and several shows in the UK and Ireland with Led Zeppelin's Jimmy Page and Robert Plant in 1995. In August 1998 they were once again invited to open for the Rolling Stones on their 'Bridges to Babylon" tour of Europe prompting Mick Jagger to say that Big Country were "one of the best opening bands we ever had". Big Country scored 17 top 30 UK singles achieving 5 gold and platinum status albums along the way. The band have performed at many of the UK and Europe's most famous festivals, including Isle Of Wight (Twice), V Festival, T In The Park, Oxegen, Pink Pop and Cropredy creating a new generation of fans and renewing the passion for diehards with the introduction of new original songs such as 'Another Country' and 'The Journey' which encapsulate not only the sound but the heart and soul of Big Country past, present and future. 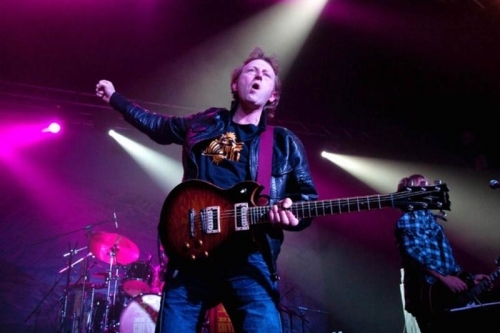 Big Country are now on tour, and rest assured that Bruce Watson and Mark Brzezicki have no plans on slowing down. BIG COUNTRY JUST GETS BIGGER.